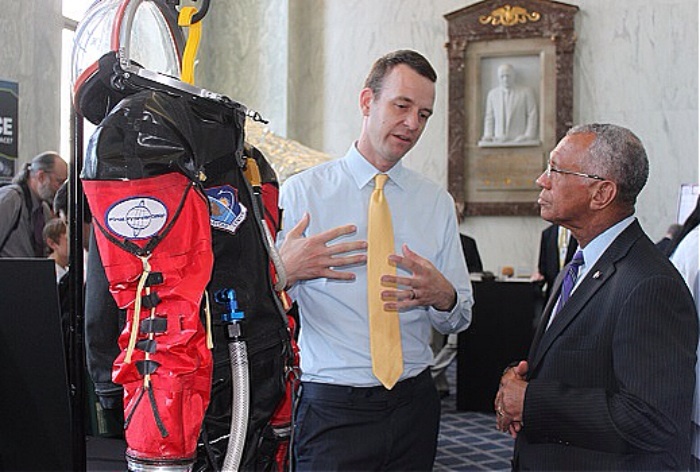 The 3G suit is a full-pressure intravehicular activity suit designed for commercial orbital and suborbital space missions. The low-cost suit is designed for operation at +5 PSI, is built for flight certification, and weighs less than 15 pounds. a simple large chest entry, detachable high-dexterity gloves, integrated communications port, lightweight accessible pressure regulator, self-donning/doffing capability, and cooling loops for the head, chest, hands and feet. The 3G suit is the culmination of more than 4 years of internal space suit development, funded in part by a Kickstarter campaign in 2012. FFD is in negotiations for delivery of at least five additional suits in 2013, including suits for NASTAR Center and Zero2Infinity. Final Frontier Design was founded in 2010 after a prize-winning entry in NASA’s Astronaut Glove Challenge. Final Frontier Design is currently fulfilling two NASA contracts related to EVA space suit technologies. Fantastic. I remember first hearing about them through this video. By the way, any idea what building that picture is in? Who is the statue on the wall?